Woolly Mammoth Mammuthus primigenius by Josef Moravec. Oil painting 26" x 34". (Framed). Woolly Mammoth was a cold climate dweller equipped with a thick layer of fat for insulation, and an exterior of long black hair. The Woolly Mammoth was smaller than most mammoths, and had a hump of fat behind its domed head. It fed on low tundra vegetation in which it scraped away snow and ice from with its ivory tusks. Several well preserved remains have been found in Siberia and Alaska and cave paintings in Spain and France show depictions of the Woolly Mammoth as seen by early humans. The mammuthus primigenius went extinct only about 10,000 years ago. Wooly Mammoth, Art Print 8.5" x 11"
Wooly Mammoth from Pleistocene epoch is printed on premium glossy photo paper 8 1/2" x 11". Original oil painting by Josef Moravec. Woolly Mammoth, Ice Age Mammals, Art Picture, 13" x 19"
Woolly Mammoth. Mammuthus primigenius. The picture is printed on premium photo quality super "B" paper 13" x 19". 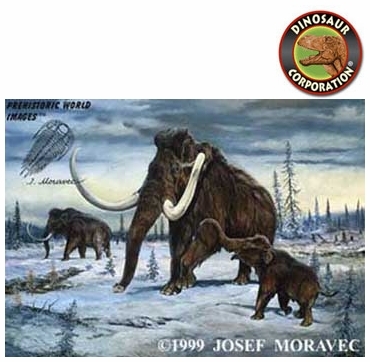 Original oil painting by Josef Moravec is in the Art Collection of Dinosaur Corporation. Woolly Mammoth, Framed 17" x 14"
Giant Ice Age Animals, Woolly Mammoth from Pleistocene Epoch. 17" x 14" solid wood frame, double matted in glass. The picture is printed on premium photo quality super "B" paper. Original oil painting by Josef Moravec. Woolly Mammoth Family, Giclee on Canvas, 30" x 24"
Woolly Mammoth. Ice Age Animals. Reproduction of original oil painting giclee on canvas. Size 30" x 24" (76 cm x 61 cm). Canvas stretched on wood bars. Original oil painting by Josef Moravec.